When most Americans hear the word “macaroon,” they think of a soft cookie made of flaked coconut that holds its shape with the help of a bit of sweetened meringue, and is then dipped in chocolate. French Macarons, while sharing some similar characteristics to this coconut confection, are quite different, and quite extraordinary. A French macaron has a glossy, domed top with a ruffled edge and flat bottom. Crisp on the outside, and soft and chewy on the inside, they are made with only three ingredients: ground almonds, sugar and egg whites. The recipe has roots back in the 16th century, when Catherine de Medici brought it to France from Italy. The modern interpretation of the macaron was developed in 1930, by Pierre Desfontaines of Laudurée, a famous luxury patisserie in Paris where it is said that 15,000 macarons are sold each day. It was Desfontaines who came up with the idea of sandwiching two cookies together with a creamy ganache filling. The making of French macarons is notoriously challenging, and for this reason, they remain a rare find in the US. 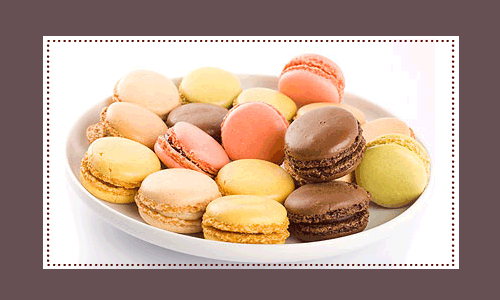 La Renaissance is proud to offer a variety of freshly baked macarons including chocolate, coffee, pistachio, almond, vanilla, strawberry, and lemon. Drop by sometime to give them a try or pick some up as a thoughtful and unique gift. 3/15 UPDATE: We just learned that Saturday, March 20 will be the first annual “Macaron Day” in NYC. Read about it here. In honor of this American version of France’s Jour de Macaron, La Renaissance will be giving away a free macaron to each customer this coming Saturday.